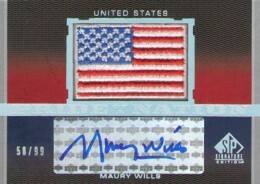 Home » Baseball » Did 2012 SP Signature Edition Baseball Rely on Old Carnie Tricks? 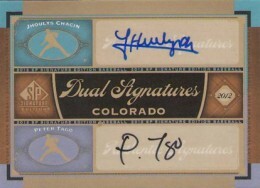 Did 2012 SP Signature Edition Baseball Rely on Old Carnie Tricks? Back in the day, carnies used to stand on stage (or a small wooden crate if they hadn't made the big-time) and bark out to passersby, looking to hook them for some money. Hur-ry, hur-ry, step right up! Behind this curtain is something spectacular! Something magnificent! Something astonishing! Just hand over your money and ya can peek behind the curtain. You won't believe yer eyes! Whad'ya say, mister? It was a bunch of hype that promised more than it actually gave. Bearded ladies, exotic creatures, people who could perform amazing tricks. Usually, there was a lot more story than there was truth. That man from the wilds of the Borneo was more likely someone from the streets of Brooklyn. But once the people had spent their money, to the carnie, it didn't matter. The crowd had been hoodwinked and there was nothing they could do about it. The carnie moved on to another town and repeated the process all over again. When Upper Deck originally announced 2012 SP Signature Baseball, they planned on a quick turnaround with a whole week between the initial announcement and the street date. It was very odd to have such a short window. There had to have been a reason for it, but Upper Deck was keeping quiet. The promise of three autographed cards per box was supposed to be enticing enough. Hur-ry, hur-ry, step right up! And if that weren't enough, one of those cards either had multiple autographs or came with a patch. Plus, 50 Hall of Famers would be on the checklist. Yes, sir! It's amazing! It's astonishing! To further add to the strangeness of the situation, the only images that were given in advance were ones of the box, not the cards. Sorry, but if you wants a peek, yer gonna have ta pay. Quickly, many began to speculate. Honestly, I did myself. Would the cards have player photos? Was the whole thing just a sticker dump to make use of autographs that had been lying around? Could these cards be so amazing that the secrecy was all part of the ploy? But it was all speculation. All we had was the promise of autographs, a price tag and a picture of a box. Then 2012 SP Signature Edition Baseball didn't show. No explanation was given. More rumors began to fly. Was it cancelled? Was it simply delayed? Delays are not uncommon in the hobby. As it turned out, the sky hadn't fallen. The set was merely pushed back. A couple of months went by and 2012 SP Signature Baseball fell off the radar. But then came word that Upper Deck put it back on the calendar, just in time for Independence Day. Not only that, the set now had the blessing of the MLBPA. But still no pictures of the cards themselves. Not even a mock-up. All we had was the promise of three autograph cards per box and a couple images of a box from a couple of enticing angles. Sorry, sir. Like I said, if you want to see the show, yer gonna have to buy yer ticket. Well, 2012 SP Signature Edition Baseball is here. And if the early images are any indication, quite frankly, the cards are a joke. The speculation was right. No photos, just generic designs that have a lot and nothing at the same time. There's a lot of writing, much of it curly. The color palette is big too. But is it all just a distraction from the little substance these cards actually carry? All things aside, my issue isn't so much about the lack of photos as it is the seemingly shady way it was approached. Why the need for such secrecy? The obvious answer is that many collectors would balk. It's hard enough marketing a product that has photos but not a full license. Hence the need for secrecy, or at least no official word. It's like the carnie and the curtain. Once you see what's back there you might be disappointed. But once the money's been paid, everything is fair game. We're beyond the point where collectors should be treated like rubes and suckers. If manufacturers don't feel good enough about their products to let the buying public know what they can fully expect in advance, they probably shouldn't be releasing them. Personally, I don't have a problem with autographs with no photos. While it might not be my personal collecting preference, others might be happy simply having an authentic autograph. Why not market the set towards those people? Yes, Upper Deck might have ended up selling fewer boxes of 2012 SP Signature Baseball or not been able to get as much for them, but they'd still have collector goodwill. One has to wonder how many people are going to feel like suckers after shelling out close to $300 for a box for this stuff and being disappointed with the results. It's a short-term sale for the manufacturer but it could make some think twice before buying something from the company again. In Upper Deck's defense, 2012 SP Signature Edition Baseball is delivering exactly what it promised. It does have autographs falling at the promised rates. There is some value in that. How much? Now that it's out and Upper Deck has collected their money, it's up to the secondary market to decide. But if early eBay listings are any indication, the results aren't going to be pretty. By not being up front about the lack of images across the product, it looks like Upper Deck didn't believe in what it was selling. If they did, we would have at least been told what to fully expect, if not seen a sample or two. That would have given collectors the right to choose whether they liked the format or not. Now that the set is out, collectors do have that choice. But one of the big selling points of 2012 SP Signature Edition was its limited print run. It encouraged presales so that collectors wouldn't get left out. Old-time carnies could always rely on the next town over once their tricks were revealed and interest waned. It's not the same today. Word travels fast. This may give Upper Deck some sales in the short-term, but what about the long-term? Not only are those who feel like rubes today going to be suspicious of the company, but so too will their circle of friends. Hur-ry, hur-ry, step right up. Behind this curtain is something spectacular. Something magnificent. Something astonishing. Whad'ya say, mister? The actual cards have now hit eBay and they’re not terribly appealing. I wouldn’t touch this with a ten-foot clown pole. Tim (ID 46530) � Thanks for the kind words, Tim. As a player/team collector, the checklist at least looks pretty good for me, I’m pretty impressed by all the classic Blue Jays included. It wouldn’t get me to buy boxes though, as there’s no guarantee I’ll get something I’m interested in.I’ll stick to maybe buying some singles on ebay when the price is right. Just saw a seven signature card numbered to 2 on ebay I’d love but too rich for me.